A CNAME (Canonical name) record, is basically an alias or nickname for another domain. It is often used instead of an A record to point different hostnames to the same location. The difference between the record types is that an A record always points to an IP address, while a CNAME always points to another name. 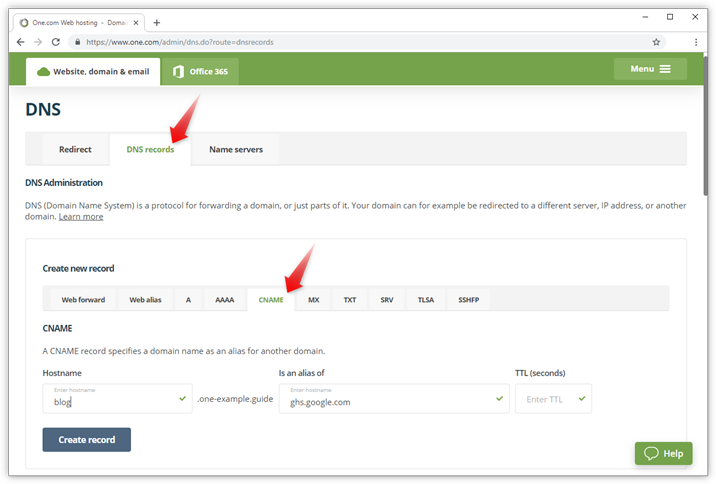 A CNAME is often used to point a subdomain on your domain to an external service, like for example Office 365 or Blogger. Under create new record, click CNAME. - The subdomain (required) that will become the alias, for example, www. - The domain name that you want to create the alias of, it can't be an IP address. Example: In the screenshot below we are making blog.one-example.guide a into an alias of ghs.google.com. So we can serve our Blogger blog on our own domain. The TTL is left empty, meaning it will default to 3600.